Cancer Patient Injured in Arson Fire On Wednesday, February 20th, 2019 at 11:30am my mother received a phone call from the local fire department stating that her home was on fire. She immediately left work to go to her home, where my stepfather should have been resting following a radiation treatment for stage 4 lung cancer. He was not resting, instead he was on his way by ambulance to the local hospital to be treated for 1st, 2nd and 3rd degree burns to his face and body. At approximately 11:00am, my stepfather was sleeping in his bed, weak and not feeling well due to a cancer radiation treatment he had just received. My mother had left just an hour before to go to work. Wayne was awoken from his slumber, by the sound of glass breaking, from down the hallway. He struggled to get out of bed to investigate, but his four fractured ribs due to the pressure from the tumors growing in his lungs made it difficult. He finally was up, and started to walk down the hallway and was terrified to see that the living room was completely engulfed in flames, and traveling very rapidly into the kitchen and dining area where he was standing in utter disbelief. He described the heat as nothing you could ever imagine, that it was so hot he could feel his skin burning and he was 20-30 feet away from the flames. He had no where to go, his exits blocked by flames and if he went back to his room he would be trapped for certain. The only exit for him was to catapult his body through the sliding glass door on the second floor of the house, he would be outside but the flames were burning so quickly he was unsure he would make it out alive. There he was out on the 2nd story balcony screaming for help when from the side of the house came several fire fighters with a ladder. He was rescued, thank God, however it was apparent he was in need of immediate medical care. Wayne had already been rushed to the hospital by ambulance by time my mother reached the house. The Fire Marshall was there to meet her, and what he had to tell her sent shivers up and down her spine. 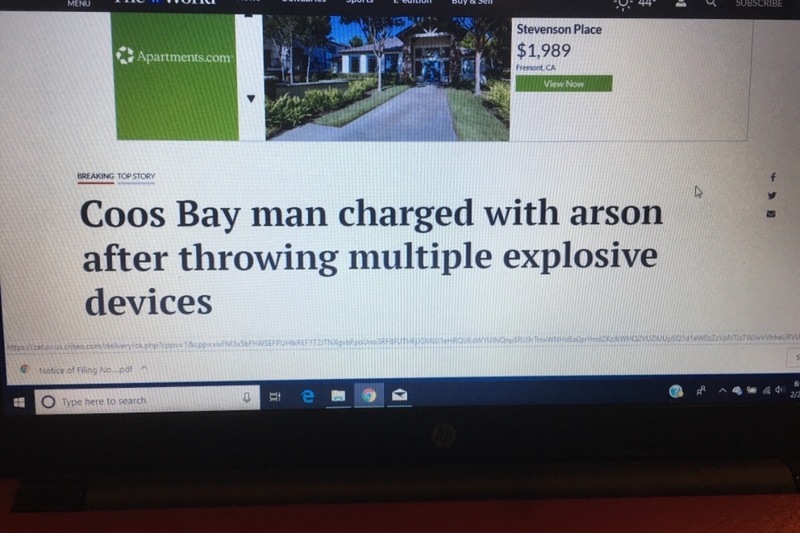 He calmed her down as much as he could, and then he very calmly explained that her home was on fire because someone had thrown a Molotov Cocktail through her living room window. They knew that because seconds after the bomb pierced the window and landed on the couch to ignite the fire that would in turn gut my parent’s home – they got word from a neighboring city that the same thing had happened in their town, and the suspect was known to the victims in that fire. My mother was beside herself, they have no enemies, they’ve lived in their home for almost 10 years and it’s a beautiful quiet neighborhood, she works for the local church and they are involved in many community events and are do-gooders for those in need. She was in disbelief and helpless to the destruction the fire was doing to her home, the only thing she could think of was to get to Wayne as soon as possible to make sure he was okay. Wayne was treated for burns to his body and face. His hair and clothing full of black sout from the intensely burning fire, and the strong odor of some sort of accelerant seemed to be emitting from his pores. My mother contacted the Fire Marshall where they again went back to the house together. Although Wayne had experienced such a traumatic event, he was determined to see his house and it’s condition. They arrived. Again meeting the Fire Marshall in the driveway. The home looked just fine, no damage to the exterior walls or ceiling. They were both relieved for a brief moment until Wayne asked the Fire Marshall if they could go in to the house to retrieve some clean clothes and other personal affects. The Fire Marshall broke the news to them that the fire had burned so hot and so fast that it completely insinerated the main floor of the house, and there was no way for them to safely access their bedroom or any other area of the home. My mother wept out loud sobbing, “why is this happening? !” as Wayne tried to console her. The Fire Marshall told them that the initial arson investigation pointed to the Molotov Cocktail containing petroleum, and the toxicity of petroleum to humans is very high. He also told them they would need to hire a contractor to come in and assess the damage and what the cost would be to rebuild. The next sentence from the Fire Marshall’s mouth would bring some solace to both my parents. He told them that as of 8:00pm that evening, they had a suspect in custody and he was being questioned by police. That gave them both a bit of relief – knowing that he wouldn’t be back. They both decided to get into the car and find a hotel room for the evening. My mother got on the phone with the insurance company and started explaining. The homeowners policy should hopefully cover the bulk of the damage. But Wayne’s cancer treatments are weekly, the cost each treatment is $12k and he has been stripped of being in the comfort of his own home for who knows how long. The medication he is to take, was in the house and could not be retrieved. The oxygen tank was in his bedroom. Above all that, my parents have been dealing with so much for the past two years fighting this disease together – and now having to deal with all of this unnecessary and pointless drama, my heart is grieving for them and questioning why this had to happen to them…right now at such a trying and difficult time in their lives. They need clothes, they need food, they need everything that was in their home that they no longer have. One thing they are both extremely happy about is the fact that they still have each other. Tomorrow is Tuesday the 26th of February and almost 1 week to the day this happened. And my mother will have to take off of work and lose more income, to appear in front of the Grand Jury, and the person responsible for causing so much pain and suffering to them at a time they are already suffering and in pain. Please help them. I have done what I can but they have to rebuild they have to replace everything they’ve owned for their entire lives all while trying to fight Wayne‘s cancer. And all of the hands of a crazy person. All I ask is for a small contribution. So they can buy clothes, replaced their medication and whatever else they need. The one thing they need the most at this time is prayers. I am grateful to each and every one of you who took the time to read this, and I thank you for your kindness.